Check into your hotel. The rest of the day is free to start exploring Russia’s exciting capital city. Tonight, meet your Tour Director and fellow travelers. Guided sightseeing this morning reveals just what makes Moscow so special—from the fortified KREMLIN complex and ARMOURY MUSEUM in the heart of the historic city to the iconic onion-domed St. Basil’s Cathedral and Red Square with the Lenin Mausoleum. You’ll also visit the splendid Moscow METRO, lavishly constructed in the early 20th century to resemble a magnificent subterranean palace. An included excursion travels to picturesque Sergiev Posad with its 14th-century TRINITY-SERGIUS MONASTERY—the Russian Orthodox equivalent of the Vatican. With its imposing white-stone façade and blue and gold onion domes, this is one of the loveliest monasteries in Russia. Then, at the MATRYOSHKA MUSEUM, discover how these famous wooden nesting dolls are crafted and painted—and learn how to paint your own. Leave Moscow and travel northwest, stopping in pretty Klin. Discover the historic CHRISTMAS DECORATIONS at the local museum and have a go at decorating your own to take home. Then, explore the TCHAIKOVSKY HOUSE-MUSEUM, former country home of composer Pyotr Tchaikovsky. This is where he wrote Symphony No 6 (Pathetique) and spent his final days in 1893. See the areas where he lived and worked, as well as his top hat, gloves, and the luggage he took on concert tours. Overnight in Tver, dating back to the 12th century and situated at the confluence of the Volga, Tmaka, and Tvertsa Rivers. Start the day with a visit to the GOLDWORK EMBROIDERY MUSEUM in Torzhok, famous for its delicate gold-wire embroidery found in artwork, insignia, and royal clothing. Next, visit the beautiful Russian Orthodox VALDAY IVERSKY MONASTERY, founded in 1653. Situated on an island on Lake Valdayskoye, it became an important center of culture and education in the 17th century, and producer of fine porcelain tiles. Arrive in Novgorod and enjoy an included dinner featuring traditional Russian cuisine at a local restaurant. Visit Novgorod, the former cultural, social, and economic hub. 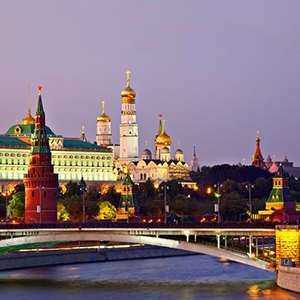 Discover its KREMLIN (city center) and magnificent ST. SOPHIA CATHEDRAL with its ancient frescoes, bronze 12th-century Magdeburg Doors, and five onion domes. Then, explore a recreated old Russian village with traditional izbas (homes), chapels, farmyards, and more at the OPEN-AIR VITOSLAVLITSY WOODEN ARCHITECTURE MUSEUM. Visit ST. GEORGE'S CATHEDRAL, dating back to 1119. 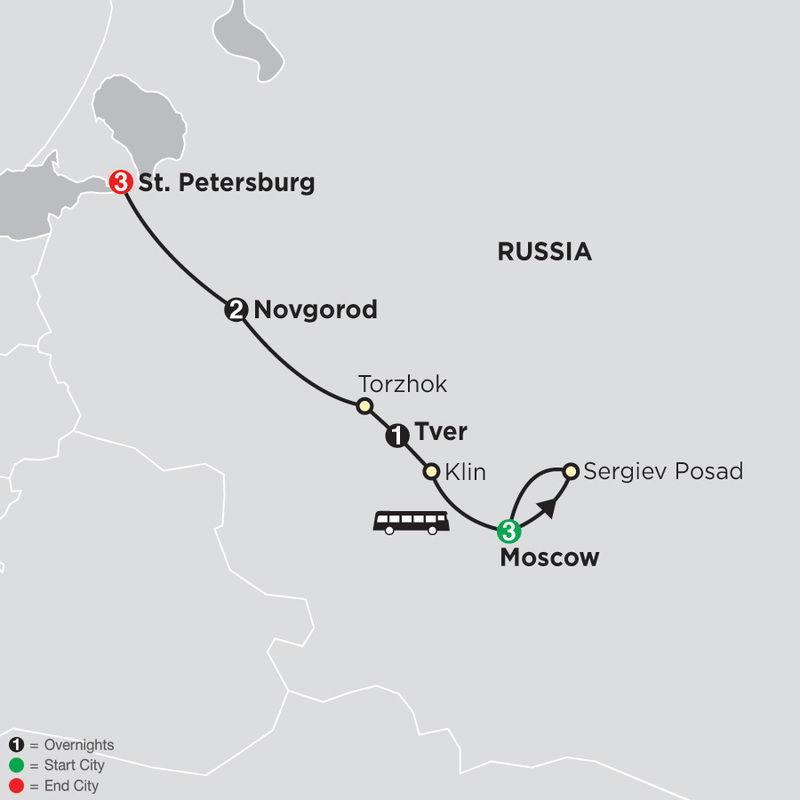 Depart Novgorod and push north to incomparable St. Petersburg, an important Russian port on the Baltic Sea. An orientation drive introduces you to some of the city’s palaces, parks, monuments, squares, boulevards, and 600 beautiful bridges. An architectural gem founded in 1703 by Peter the Great, St. Petersburg rivals any other European capital in splendor, beauty, and distinction. During your guided sightseeing, see the city’s main sights, including a visit to the PETER & PAUL FORTRESS and CATHEDRAL, which served as a high-security jail for political prisoners. Its most famous inmates included Dostoyevsky, Trotsky, and Peter the Great’s own rebellious son, Alexei. 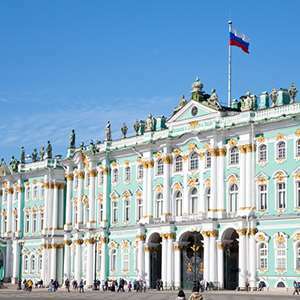 This afternoon, consider joining our guided optional excursion to the Hermitage Museum. Housed in Peter’s magnificent former Winter Palace on the banks of the Neva River, today the museum’s collection boasts precious items from around the world. A whole day in St. Petersburg to do as you please. 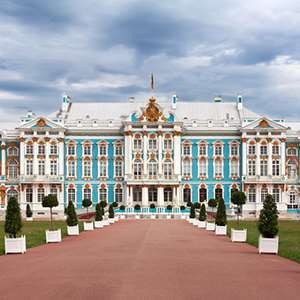 Maybe explore on your own, or join the optional excursion to the flamboyant blue and white Catherine Palace, summer residence of the Russian tsars. You may also choose an evening canal cruise to celebrate the conclusion of your adventure. See famous illuminated Moscow buildings in a magical and somewhat mystical appearance by night. Marvel at the art treasures contained in the Hermitage Museum, one of the world's greatest palaces. 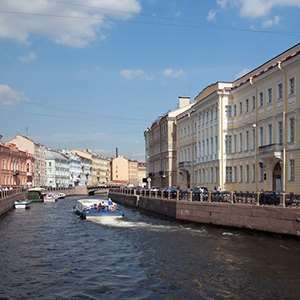 Join a cruise through St. Petersburg canals to see this beautiful Russian city from the water. Visit this fascinating monument of architecture and gardening arts of the 18th and 19th centuries.